The fungi Coniothyrium ilicinum and Phacidium species are two of several that regularly cause leaf spots on holly (Ilex) in this area. Other fungi cause leaf spots on holly but they are rarely found in New England. In addition, feeding damage by the holly leaf miner and winter desiccation cause spotting symptoms. Several Ilex species are susceptible to Phacidium species or holly tar spot, while Coniothyrium ilicinum normally causes leaf spots on leaves of American holly (I. opaca). Small to large irregularly shaped yellow-brown spots appear during the winter and spring on old American holly leaves infected with Coniothyrium ilicinum. 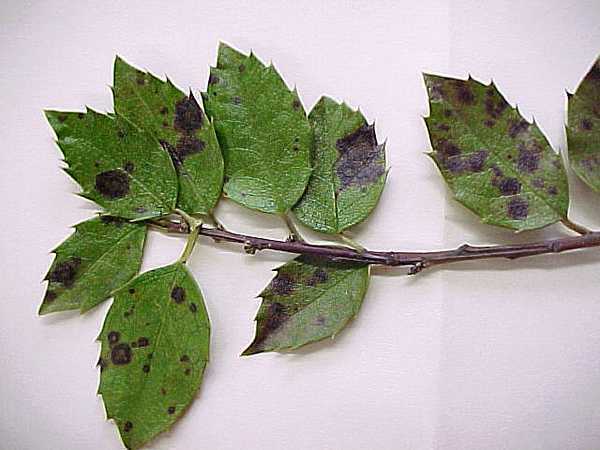 Heavily infected leaves drop prematurely from the trees in the spring. Phacidium species initially causes yellow spots on the leaves of American and English holly by late spring. During the summer the spots turn red-brown then develop the characteristic black tar spot by early fall. Leaf spot diseases are more common on American holly, but usually appear during the winter and spring on old leaves. As a practical matter these fungi have not been studied enough to understand their biology and life cycle. In fact, there is some dispute about whether Coniothyrium ilicinum is a primary leaf spot disease or a secondary invader of senescing foliage. On the other hand, Phacidium species is considered a tar spot disease but its biology has not been studied in detail. Holly leaf spots seldom cause significant damage to the health of infected plants. Maintain plant vitality with proper fertilization, irrigation during dry periods, mulching, and attention to soil pH levels is the best way to minimize these diseases. Prune plants to promote, sunlight penetration, air circulation and rapid drying of foliage. Also, minimize leaf wetness by irrigating before midday so the leaves dry rapidly in the afternoon. Removal of infected fallen leaves reduces the amount of the inoculum present for new infections. Holly leaf spot diseases are usually more severe after wet springs, but they rarely warrant fungicide controls. Fungicide sprays protect the new green shoots and leaves. Begin sprays as the buds swell and reapply 2-3 more times at label intervals to maintain protection during vulnerable periods.